If you plan to purchase a pressure cooker for the first time, or if you are considering upgrading to a newer model, you'll be faced with a variety of choices when you begin shopping for a pressure cooker. To help with your decision, we've prepared this buyer's guide so you’ll be able to determine the model that is best suited to your needs. What is the difference between aluminum and stainless steel pressure cookers? Aluminum pressure cookers are lightweight, low cost, and provide uniform heating performance due to the excellent heat conduction of aluminum. With heavy use, however, aluminum cookware will stain and pit and, although this doesn’t affect how it cooks, it’s important to note aluminum’s intrinsic weakness. Economy is the main reason to choose an aluminum pressure cooker. Stainless steel pressure cookers are nonporous, slightly heavier, and more expensive than aluminum models. The extremely durable nature of stainless steel will provide years of use with a beautiful high luster finish. However, by itself, stainless steel is not a good conductor of heat, so it’s best to select a model with a layered base, usually a disc of aluminum bonded to the outside bottom of the pan. This will greatly improve the heating characteristics and performance of a stainless steel pressure cooker by eliminating “hot spots” that would otherwise be common in stainless steel cookware. What size pressure cooker is best? Most pressure cookers are sold by the size of their total liquid capacity even though the actual usable capacity of a pressure cooker is one half to two thirds of its liquid capacity, depending upon the food being cooked. The extra space left in the cooker is necessary to allow steam to build inside the unit. Although, there are many sizes of pressure cookers in the marketplace, the most popular sizes are 4-, 6-, and 8-quart liquid capacities. We’ll explore the advantages of these popular sizes to help you determine the best size for your needs. 4-quart: A good size for singles or couples or for making one course for a family, such as potatoes or vegetables. Whole meal recipes for one or two people can usually be accommodated in a 4-quart pressure cooker. 6-quart: The most popular size for many families of two or more. It can accommodate most foods and most pressure cooking recipes are developed for a 6-quart pressure cooker. 8-quart: This size is good for larger families and is also an excellent capacity for making large batches of stock. NOTE: Large-size pressure cooker/canners (16-, 18-, and 23-quart models, for example) are also available and used generally for pressure canning meats, vegetables, and other low-acid foods in pint and quart jars. For pressure cooking use, these large size canners are usually suitable only if you are cooking for a very large group. What is the best brand of pressure cooker? Over the course of time, many different companies have manufactured pressure cookers. Because the pressure cooker you purchase today should be expected to provide many years of service, it is important to select a brand that will allow you to get the most from your investment. Therefore, the following guidelines should be considered when making your selection. Choose a brand from a company that has been in business for a number of years and has a stable financial track record. To keep your pressure cooker operating properly and safely for many years, you will have to periodically replace a few inexpensive parts (just as you would replace spark plugs and fan belts on your car). You need to be confident that the brand you purchase today will be from a company that will be in business for years to come in order to assure a supply of the proper parts. Parts are not interchangeable from one brand to another, so don't select a "brand X " model simply because it is less expensive. Buy a brand handled by a reputable retailer. This could be a local store of a national chain, a department store, a well-established kitchen store, your local hardware dealer, or a respectable web retailer. You may want to select a retailer that also stocks the replacement parts you will eventually need. Select a brand that has been listed or approved by an independent testing organization. This will ensure that your pressure cooker meets or exceeds certain quality and performance standards that have been independently verified. Underwriters Laboratories (UL) is the testing organization familiar to most Americans. Which pressure cooker features should you look for? NOTE: If you have not done so already, it is best to review the How To Select The Right Model For Your Needs section to determine the type and size of pressure cooker you want before studying these specific features. If you are not familiar with pressure cooking, you may also want to check out the How To Use section which provides a detailed explanation of how a pressure cooker works. PRESSURE REGULATOR: Every pressure cooker must have a means of indicating and controlling the cooking pressure inside the pot. Over the years, many types of pressure regulators have been designed to perform this function. There are basically three styles of pressure regulators. They are all somewhat different from each other, but will, ultimately, provide the same results with your recipe. The first is a weighted valve pressure regulator (sometimes called a jiggle top), the second is a modified weighted valve pressure regulator, and the third is a spring valve pressure regulator. Regardless of which one you choose, always select a regulator with a maximum operating pressure of 15 psi (pounds per square inch). This is the standard pressure used in pressure cooking. Virtually all recipes are written for a pressure of 15 psi and if the operating pressure on your cooker is lower than 15 pounds, you will not realize the maximum time savings. Weighted Valve: The weighted valve pressure regulator is placed on top of the vent pipe, which is a small opening in the cover of the pressure cooker designed to allow excess steam to escape during cooking. Always select a pressure cooker that has a removable pressure regulator. This is important because you will want to examine the vent pipe before each use to be sure it is clear, and clean it if necessary. Weighted valve pressure cookers regulate the pressure inside the unit with a rocking motion. When you hear and see the pressure regulator begin to rock, the cooking time begins. Adjust your heat setting to a lower temperature to maintain a slow, gentle rock. This type of regulator will automatically release steam from the cooker in order to maintain 15 psi (pounds per square inch), the pressure needed on most pressure cooking recipes. Maintaining a slow and gentle rock, however, is important because it keeps the steam release to a minimum. The rocking motion also provides a continuous audible and visual indicator that the pressure cooker is operating properly and maintaining the proper cooking pressure. If your cooker becomes completely quiet, you will know -- before it’s too late -- that your recipe needs attention. Pressure cookers with this type of regulator are modestly priced. Modified Weighted Valve: The modified weighted valve pressure regulator is attached to the cooker. It does not rock, but, instead, intermittently releases steam in short bursts letting steam escape when needed to maintain 15 psi. Cooking time begins when steam begins to escape from the regulator. It is sometimes difficult to tell when steam begins to escape, so you must watch carefully. You will need to adjust your heat setting to a lower temperature to maintain a slow release of steam. Pressure cookers with this style of regulator are modestly priced, sometimes slightly higher than the weighted valve regulator. 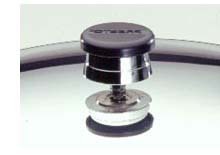 Spring Valve: The spring valve pressure regulator features a short pop-up valve (about 1”) that indicates the level of pressure inside the cooker. It usually offers two cooking pressures, most likely 10 and 15 psi, although the one used most often will be 15 psi. This type of regulator is not audible, so you will need to watch the pressure cooker carefully to see when is has reached the appropriate pressure and adjust the temperature on your stovetop to maintain the level of pressure needed. Pressure cookers with this type of regulator are more expensive than those with the other regulators. NOTE: Pressure cookers with any of the above regulators are completely safe to use. Although they maintain pressure by using different types of regulators, you won’t notice a significant difference in how they perform with your recipes. Although less liquid may be required when using a pressure cooker with a spring valve regulator. 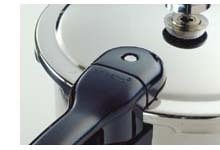 COVER INTERLOCK: Always choose a pressure cooker with a cover locking system. This important device will prevent pressure from building until the cover is properly locked and locks the cover until pressure is safely reduced. Not all pressure cookers offer a visual pressure indicator, but for those that do, it serves as an additional safety device to signal if there is pressure inside the cooker. In addition to the aforementioned safety features, always look for secondary pressure relief mechanisms that are designed to release pressure in the unlikely event that the vent pipe should become blocked. COOKING RACK: Select a pressure cooker that comes with a cooking rack or basket. This will allow you to cook foods above the cooking liquid. In addition, when pressure cooking several foods at once, the rack or basket will enable you to keep foods separated so flavors will not intermingle. PRESSURE RELEASE: Recipes will call for either the “cool cooker at once” pressure release method or the “natural pressure drop” method depending on the food being cooked. Cookbooks refer to these methods in slightly different terminology, so it’s important to understand the meaning of each phrase. Always follow the directions in the recipe for the cooling technique recommended. With the “cool cooker at once” method, place the cooker under cold running water or in a pan of cold water to quickly and easily release the pressure in the unit. The cold water releases the pressure inside the unit quickly and neatly. Some cookers feature a Quick Pressure Release Knob. With this, the cooker is moved off the heat source and the Quick Pressure Release Knob is activated sending a considerable spray of hot steam into the kitchen. If this method causes sputtering, it will be necessary to run cold water over the cooker to release the pressure. For a “natural pressure release”, you simply remove the cooker from the heat source and let the pressure drop naturally, or of its own accord. HANDLES: Pick up any pressure cooker you are considering and handle it as you would at home. Make sure the handles feel comfortable and secure. Better models of pressure cookers have ergonomically designed handles for comfort and ease of handling. 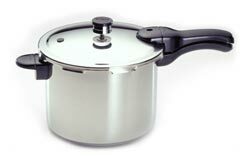 A 6-quart or larger pressure cooker should have handles on both sides of the body to aid in lifting the unit. Many times one side will have a smaller "assist" or "helper" handle for this purpose. BASE: If you purchase a stainless steel pressure cooker, be sure to look for a model that has a bimetal or trimetal base, typically an aluminum-clad bottom. This feature virtually eliminates scorching and provides excellent heat conduction and easy cleaning. INSTRUCTION/RECIPE BOOK: It’s vital to have a comprehensive instruction and recipe book packaged with your pressure cooker. It should have both clear, detailed operating instructions and a good selection of basic pressure cooking recipes. Unlike other instruction manuals, your pressure cooker manual will be referenced often. WARRANTY: Look for a pressure cooker that offers an extended warranty. Reputable companies offer at least a 10-year warranty. COST: Prices will vary widely depending on the “bells and whistles” on the various models you review. Although we are not mentioning brands, all of the types of pressure cookers described on this web site are completely safe to use, and if they have met the criteria in this Buyer’s Guide, they will cover your cooking needs nicely. 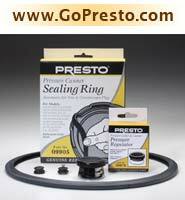 Genuine replacement parts for many models of Presto® Pressure Cookers and Pressure Canners. Genuine Presto parts assure top quality and exact fit. Replacement instruction booklets available for most models. Order via the internet anytime, day or night. Copyright 2007 by National Presto Industries, Inc.